Sweet Relish was surprisingly easy. I cut up all the onions, bell peppers, and cucumbers and added the pickling salt (1/4 Cup for a single batch) to the, stirred it up and let them sit for 2 hours. The cutting up of all the veggies was the longest and tiring part. The rest was easy and pretty simple. I also made a double batch because I wanted to get a few pints to my awesome neighbors who give us produce all the time. Plus they had us over for a beer and gave us pickles. After the soaking period, I rinsed all the salt off the mixture and made the pickling mixture. Bring this to a boil and then add the rinsed veggie mix and bring to a boil again. Let cook until it is the desired consistency. I made mine a little runnier than I wanted it and next time I think I'll let it cook longer and start the relish before I get the jars going. 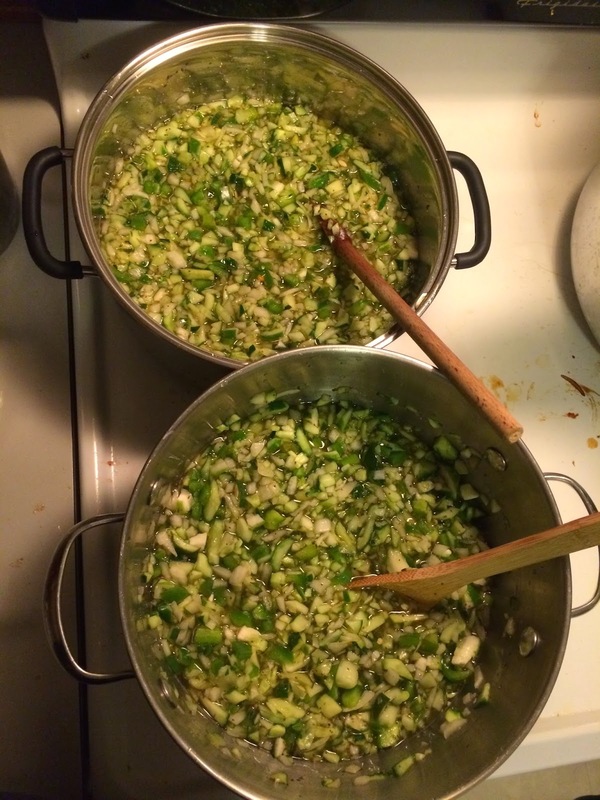 When you are ready ladle hot relish into clean hot jars. Wipe rims, adjust lids, boiling water canner process for 10 minutes. I let mine go double time since I did pints and the recipe called for half-pints. Just to be sure. I always like to leave it in longer to make sure to kill everything in the jar rather than risk my families health. Plus, if it cooks a little more what does it really matter right? I doubled the recipe, but I didn't have a large enough pot so I cooked them separately until I had boiled out enough of the juice to put them together. It turned out pretty well this way. Although I think I'll make just a single batch of it next time. This makes 7 half-pints, but I doubled it and made 7 pints-2 of which went to my neighbor. So, sweet relish is done and I'm going to try my hand at catsup so I can use up these tomatoes on my counter. This is the kind of ACV that I like. It is good and good for you. I try to use it in everything that I make. Until I start making my own I suppose. But, my apple trees are not producing quite yet. Maybe a few more years before they are producing, so until then. 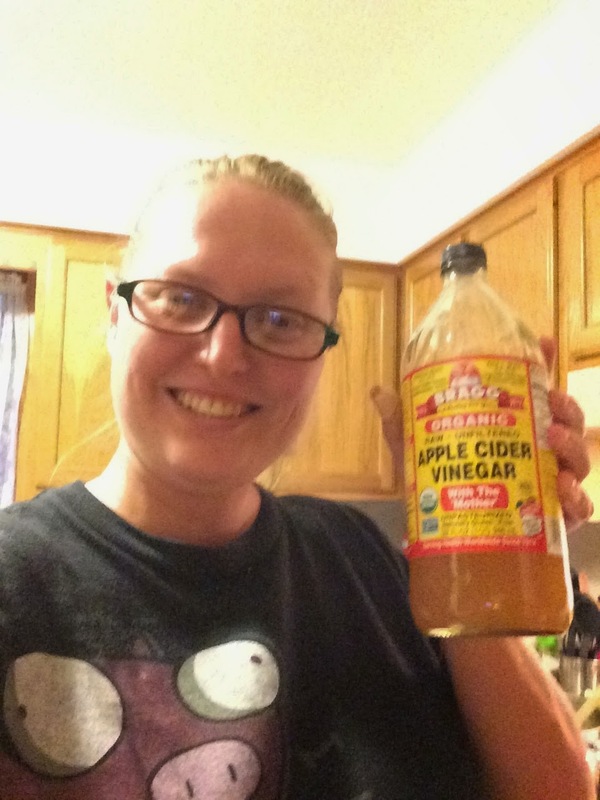 This is my endorsement for ACV. I even drink it when I feel sick. Better than gatorade and less sugar too. Although it was MUCH cheaper down south. I think the cost to truck it up here is the biggest hiccup. When I find a good health food store I'll buy it by the gallon and save a little bit. This is the finished product. It looks so pretty in the jars. I would be ok giving this as gifts for people who liked it on their hot dogs or something. Maybe a thought for next year?? 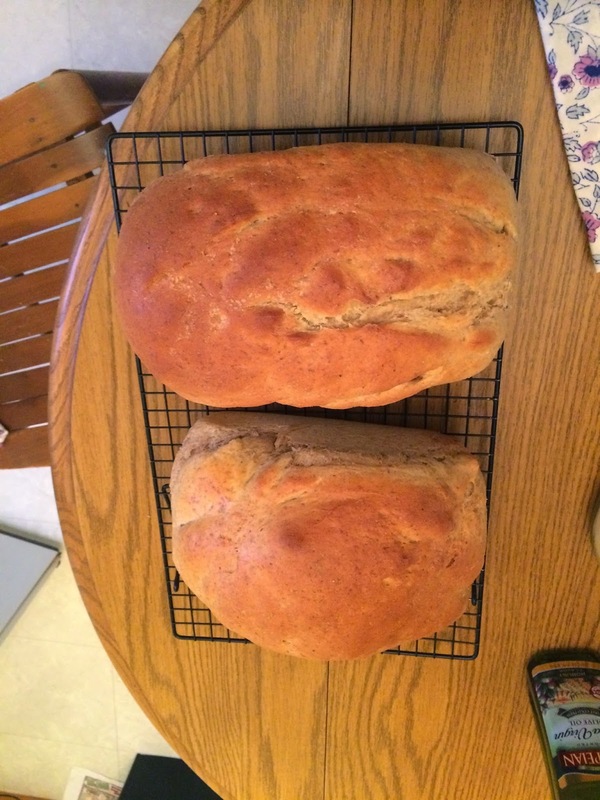 And surprise...my DH made bread for me! He is really good at it. Actually better than I am, and he made honey wheat! YUMMY. It's good straight out of the oven or warm with butter, toasted with jam or as a sandwich. I think we will make our own from now on. Easy and better for us plus no preservatives. That really is my favorite part. I hate the thought of putting that junk into my body. He wants me to add that the recipe can be found here.